I did not get everything done that I wanted, but I got all the menu things nice, I got the stats actually doing stuff and I made it possible for you to hold more ammo. I fine tuned a good bit of stuff and caught an error that had been in my code for days but only rarely occurred. I actually managed to beat the game, something I had not done in testing since I added zombies to the game on the third day. 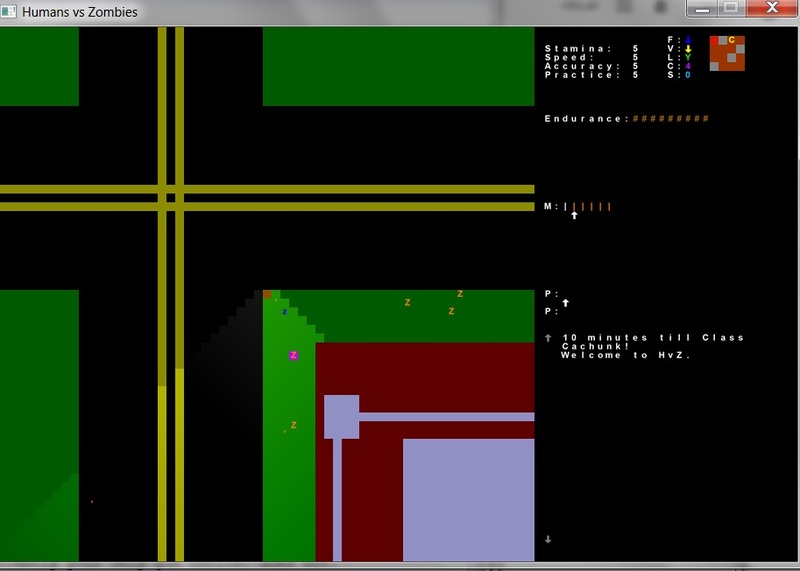 Anyways, here is a screenshot of the finished game, and after that links to the source code, as well as a .exe version. When downloading from either folder, you need all of the files in the folders in order to make the program run. This entry was posted on March 16, 2014 at 3:09 pm and is filed under Uncategorized. You can follow any responses to this entry through the RSS 2.0 feed. You can leave a response, or trackback from your own site. I have never had a problem with 4shared, but I have gotten some complains from others as well, so I will try and post a link to another site to download it from tonight. Sorry the download was giving you trouble. Thanks 🙂 Still, for next time, putting it in an archive file would be nice to avoid all that clicking! Thank you for uploading to SourceForge! Much better. The previous site was a nightmare and the sole reason that I gave up on playing HvZ. Now I can try it!